Not to be confused with Classic World 2-2. Mario Classic 2-2 is the first unlockable course in the Coin Hunter mode of Mario Hoops 3-on-3. It is unlocked along with Strange Forest when the player wins five consecutive games of Coin Hunter. 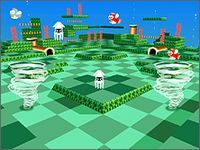 The course itself is a direct reference to World 2-2 in Super Mario Bros.. The course is set in an underwater area. Though underwater, the players move at normal speeds, dissimilar to the game's other underwater court, Bloocheep Sea. Like Bloocheep Sea, the court is full of Bloopers. These Bloopers play no significant role, as the only action they do is move when the player jumps into them. Also like Bloocheep Sea, Cheep Cheeps can be seen swimming in the background. There are a total of eleven ? Panels set in somewhat of a pattern on the ground at all times. There are three evenly spaced out on the top and bottom areas, three clustered in the middle area, and one on each side of the court. Each one gives an item that the players can use on their opponents in order to gain their coins. Like the other Coin Hunter courses, this course has two sets of Warp Pipes. The one on the upper area of the map leads to the opposite pipe on the lower area. The Warp Pipe on the right transports the player to the one on the left area. The player with the most coins after the 3:20 time limit is declared winner.